A rebel x-wing pilot just doesn’t look right in tennis shoes. If your Halloween costume could benefit from a pair of jack boots, but you just don’t feel like forking over the $300, don’t despair. You can make a pair of decent-looking costume boot tops in pretty short order. 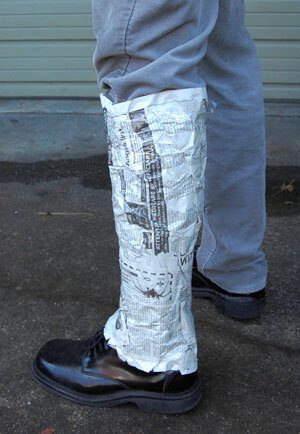 While wearing the shoes that you will be using as the basis for your “boots”, wrap your leg in several layers of newspaper and tape. Use plenty of tape. 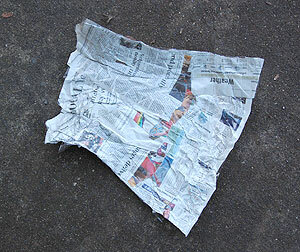 Once you have this paper boot roughly the shape and size that you like, split it down the inside of the leg with a pair of scissors, and flatten it out. Use this pattern to cut out the material for your boot. 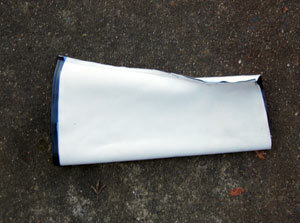 I cut mine from a scrap of black vinyl that I got from an upholstery shop. 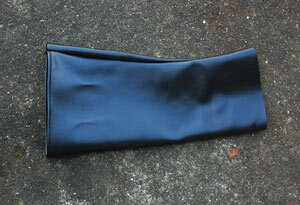 Fold the top edge back and sew a small hem to make the boot stiffer and give it a finished look. Then simply sew the tube shut and turn it inside out. For an extra stiffening and to maintain a smooth look, you can glue a sheet of stiff paper or light card stock to the inside of each calf. After slipping these tubes onto your legs, just put on the matching shoes and there you have them, boots! This entry was posted on Saturday, October 27th, 2007 at 11:46 am	and is filed under Easy Projects. You can follow any responses to this entry through the RSS 2.0 feed. Both comments and pings are currently closed. I have used the same method to make pirate fancy dress boots. I just added a wide top and some trimming. Or you could buy a second hand real pair of Boots and save a lot of time. Another thing you can do is buy rubber boots at e.g. wal-mart. There are shiny kids’ ones that cost about $12. You can cut the top off just below the ankle flare and you’ll have the same boot effect with lots less effort (plus color choices). 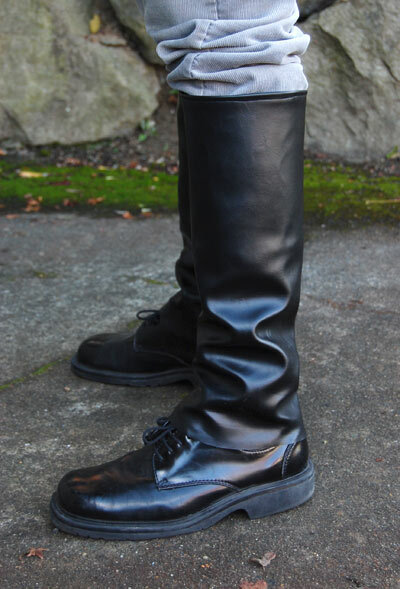 State Line Tack has “paddock boots” of rubber, which are shiny, black and look like jackboots, for about $40.